LOCATION.--Lat 40`00'55", long 75`12'26", Philadelphia County, Hydrologic Unit 02040203, on left bank 100 ft upstream from dam at Ridge Avenue, 750 ft upstream from mouth, and 1,000 ft northwest of Gustine Lake in Philadelphia. PERIOD OF RECORD.--June 1897 to September 1903, January 1905 to July 1906, October 1965 to current year. Prior to October 1965, records furnished by Department of Public Works, City of Philadelphia. Records for 1971-74 published in WDR PA-81-1. Prior to October 1965, published as "near Philadelphia". GAGE.--Water-stage recorder, water-quality monitor, concrete control, and crest-stage gage. Datum of gage is 26.41 ft above National Geodetic Vertical Datum of 1929. Prior to October 1965, water-stage recorder at about same site and datum. Satellite telemetry at station. COOPERATION.--Station established and maintained by the U.S. Geological Survey. Funding for the operation of this station is provided by the City of Philadelphia Water Department and the U.S. Geological Survey. REMARKS.-- Real-time water-quality data at this station are temporarily unavailable but will resume once technical difficulties are resolved. Data are being recorded at the station and stored for future availability. 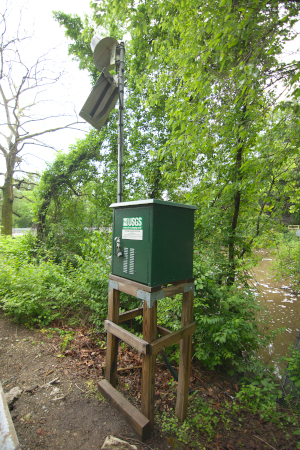 Calibration of water-quality instrumentation is conducted exclusively by Philadelphia Water Department personnel with USGS oversight. Erroneous or missing data, resulting from instrument malfunction, are not the responsibility of USGS.